Burbot (Lota lota), a fish that conjures repulsive facial impression from the typical anglers, is a fish that is completely under appreciated. Their willingness to bite is often overshadowed by their elusive nature. The best time to find them is during their spawning period; this is typically sometime in the winter between January to March. 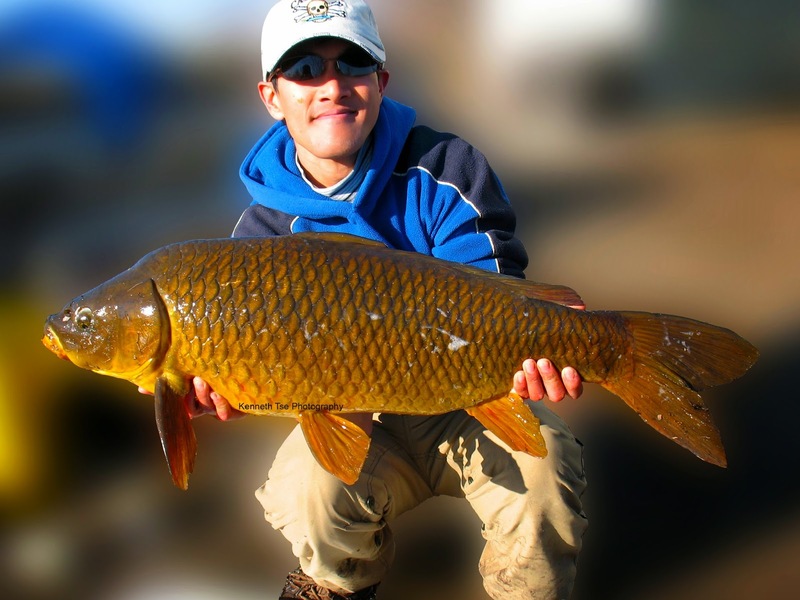 Fish in each lake may spawn at different time of the winter to complicate an already difficult task to find them. Their spawning and feeding activities peak in the dark when most anglers are often returning home after a day on the ice. If you can find the feeding flats surrounding a spawning shoal, you would indeed have a Burbot gold mine. However, it is much easier said than done. 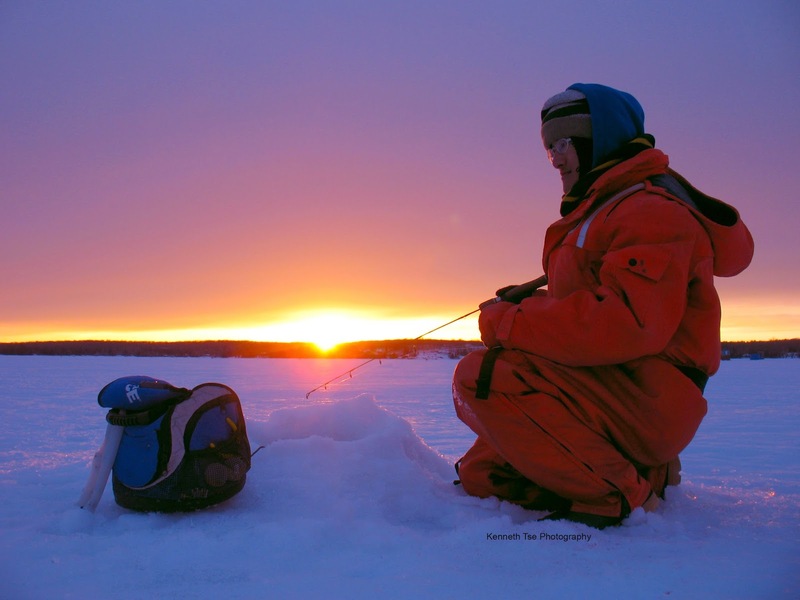 Michael and Eli had been fishing a lake in Quebec for the past two years for Burbot. Last year, they stumbled upon this location on the lake during the Burbot spawn. This year, they found the Burbot again but it has yet to be verified whether the Burbot was pre-spawned or post-spawned, since none of the fish were milting. Unfortunately, Quebec enacted a ridiculous regulation to close lakes to icefishing in all the lakes that contain Lake Trout. So this Burbot gold mine was not shut down with the coming of April 1st. This forced us to look for another Burbot fishing location, perhaps closer to home. My friend Jason had fished a lake for several year successfully for late ice Burbot. Strangely, these Burbot were not spawners but feeders. After talking extensively with Jason, we decided to set aside a weekend in late March to explore this new option. Our party consisted of Michael, myself, and my buddy Matt, his dad Jeff and grandfather Papa. On Saturday, we started our drive at 4am and met up along the way to the lake. Finally reaching our location well into the morning, we headed on snowmobiles to an established set of huts in the middle of the lake. We found the 40 feet of water depth and started setting up base camp. Our plan was to fish for Lake Whitefish and Lake Trout during the day, then explore and search for a 20 foot hump that was possibly a spawning area, and return to the 40 feet depth for the dark hour Burbot bite. Michael and I planned to camp on the ice overnight to maximize our Burbot fishing time. Our day time fishing was very disappointing. We marked a lot of Rainbow Smelt in the area but there were only a handful of unwilling larger fish marks. Michael and I decided to take the snowmobile and go on a hole augering spree. After about 2 hours of searching, we had mapped out the 20 foot hump very well. Unfortunately, the hump had soft bottom with weed growth, not the type of rocky reef that we had hoped for. We toured the lake a bit speaking with other anglers who all reported slow fishing in the recent few weeks. Word was that the ice and snow was too thick such that it blocked sunlight and oxygen from the lake slowing the fish activity. After returning to Matt and his family at base camp, we decided to make a move minus Papa who was going to check into their hotel. We moved further south of the huts to fish a location where Michael caught a couple of Lake Whitefish a week ago. We marked less Rainbow Smelt in this area and finally started seeing a few Lake Whitefish on the sonar. One whitefish came up to inspect my lure but turned around at the last moment. Less than a minute later, Michael, who was fishing just another 30 feet from me, hooked up a whitefish. Unfortunately, the hook came out at the hole just as I was reaching down for the grab. The whitefish seemed to come around in small school for about 30 minutes. It was completely quiet after and it was getting toward 4:30pm. Matt and Jeff returned to the hotel for dinner while Michael and I tried to search for the elusive rocky bottom that burbot preferred. It was around 6pm when Matt returned to join us. The Rainbow Smelt were thicker than ever as the sun set. Their activity peaked and we were receiving some very soft bites on small jigging lures. While we were clowning around a bit, I laid down on the ice to pose as Michael took a picture. Just at that moment, I felt a definitive tap-tap and set the hook. It was an 8" Rainbow Smelt that bit harder than its size. I've caught Rainbow Smelt before but didn't have any good pictures. This one would be perfect on my lifelist. As anglers, we are truly fortunate to witness stunning sunrises and sunsets on a consistent basis. They have become somewhat of a common occurrence for me now. I still appreciate them, but with much less fanfare than most people put up. I simply admire them with a quiet silence that best complements this wonderful hour of the day. 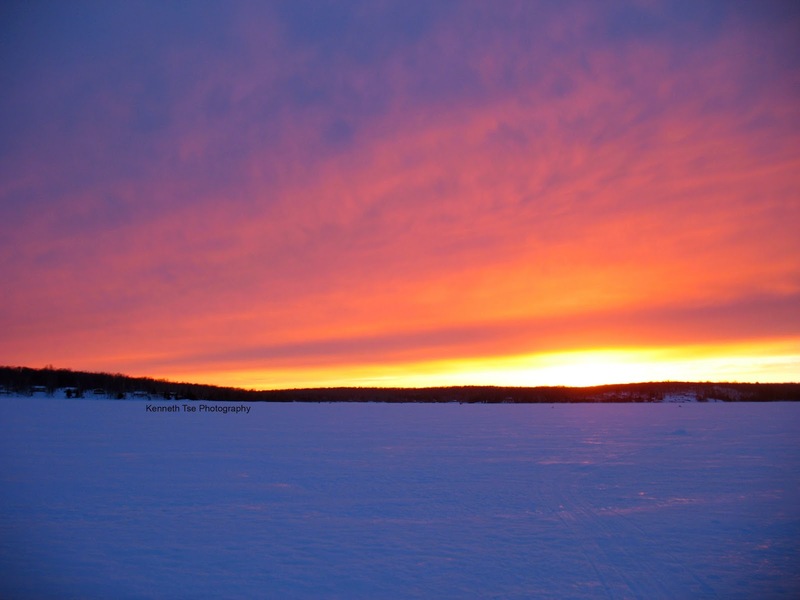 Here's "just another" beautiful sunset on the ice. Once dark, Michael and I started to set up camp for the night. It was a bit of a challenge trying to make a comfortable sleeping area out of a 5' x 5' space, half of which was reserved as fishing space. There was too little space to set up a cot. The alternative was to sleep in my camping chair. Luckily, this weekend was rather warm and it was a few degrees during the day. We didn't need to start our heaters until later at night just before we go to sleep. It was also a largely calm weekend so we didn't have any wind keeping us up at night. We only marked smelt on the screen for much of the evening. Matt said he saw a couple of larger fish but we have no idea what they might be. By 10pm, Matt called it a night and returned to his hotel room. 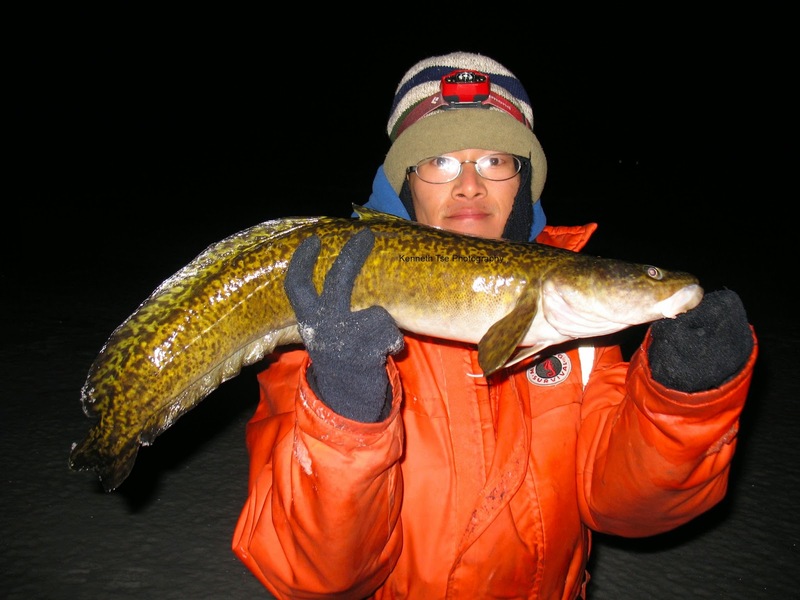 One of the key to Burbot fishing was to chum, chum and chum. I bought some frozen smelt intended for this purpose but forgot them at home. Lucikly, Michael was able to find some frozen capelin and these things smelled really tasty, or so we would assume for the Burbot. I chopped up a couple of the capelins plus a dozen of fresh dead shiners to chum the hole. I didn't see anything on the sonar for an hour, so by 11pm, I stated to doze off as the hut was getting warm with the heater on full blast. I had set up two rods to dead stick live shiners. To prevent the rods from getting pulled into the hole, I clipped a carabiner clip around the reel stem, and then tied the clip with a length of rope to the pole of my pop up shelter. The carabiner clip allowed me to quickly (relatively) detach the rod to fight the fish. I attached small metal bells to the tip of the rod as a bite alarm. It was around 11:30pm when I was rudely awaken by ringing bells. Stumbling out of my camping chair, I saw that the spring bobber on one rod was slightly depressed. I took the rod in hand and pointed it toward the hole to give the fish some slack line, while detached the carabiner clip and the bells. The line tightened some more and I set the hook. Surprisingly, nothing was on the line. Huh? I looked over at the sonar and I could clearly see a fish on bottom. Perhaps the fish grabbed the bait in a strange position such that it missed the hook on the jighead and the stinger hook all together. I reeled in quickly to check the bait. The shiner was just about dead but it was still attached on the hook. I hasty dropped the bait again hoping to reconnect with the fish before it left. Perhaps the chum would keep it around for a bit. Once the bait reached bottom, I was just taking out the slack when I felt some weight on the end. This time, I told myself to be patient. The spring bobber was slowly dipping so I dropped my rod tip to give the fish more line. A few agonizing seconds later, the spring bobber dipped some more and I pulled out another few inches of line to allow the fish more time to take the bait. Finally, the spring bottom dipped a third time and I waited until it was fully depressed and I could feel the weight of the fish on the rod before setting the hook. My heavy UglyStik rod bent into a complete arc. Oh yeah! Initially, the fish was running away from the hut. I had the second line about 4 feet away so tangling the second line was a real issue. As the fish was running, I started to reel up the other line, but had to stop a promptly when the fish swam back toward me. After pulling the fish halfway up, it dove again and this time it was diving toward my other line. Too late! It had officially wrapped my other line. Now we have an issue. I opened the bail of my other reel to feed out line. At least I can concentrate on fighting the fish now. After a last diving attempt, I finally had the fish under the hole. I was a massive burbot head that spanned the width of the 10" hole I'm guessing it was at minimum a solid 7lb fish. I could see the second line horribly tangled around my line a few times. Burbot are known to twist and turn like an eel during the fight, so I do have a hot mess at hand. Just as I was leading the fish to the opening of the hole, the Burbot twisted and kicked and the hook came out. Darnit! It took me about 5 minutes to sort everything out after. Meanwhile, I was keeping an eye on the sonar and I saw a couple of marks close to the bottom. It could be several Burbot eating the chum. But by the time I got my bait in again, the fish had moved on and I'm back to a blank screen. I was hoping that this would be the start of the night bite. Unfortunately, I only marked a couple more fish within the hour. It was getting late and my eye lids were feeling heavy due to the inactivity. Before I went to bed, I chummed the hole some more with capelin and shiners and changed the bait to a couple of lively shiners. Sometime between 12:30 and 3am, I heard belling ringing outside. I knew Michael had placed a flag outside but the consistent cadence of bells sounding like Michael was just checking and setting his line. I wasn't about to get out of my comfortable sleeping position so I stayed up in my chair. The bells stopped for about 30 seconds, then they rang again. This time there was a little wind as the bells rang, so the flag had to be up. I called for Michael but didn't hear a reply. So I went outside to check and sure enough the flag was up. I woke Michael up to check the line but there was no weight on the line. The bait was missing, but it was difficult to determine whether it had fallen off when Michael went to set the hook, or perhaps a fish had pulled the bait off as it tripped the flag. We'll never know. At 3am, the temperature had dropped to -10C overnight and heater was having a bit of trouble keeping the hut warm. My feet and legs were toasty but my back and behind were closer to the wall of the hut and I was feeling mighty chilly. I paced around a little just to get the blood flowing and heated some soup to warm my core. Boy, what a difference the hot soup made! It was a lucky coincidence that the propane had just ran out after I made soup and I swapped out a new can. Otherwise, I would have woken up to a completely cold! I fished for 30 minutes without seeing anything on the screen. It wasn't long before I settled back into sleep. This time, I turned my camping chair around so my back would face the heater. It was more important to keep my core warm. I had gotten into deep sleep when I was jolted up by ringing bells again. It was quite hilarious since I had forgotten the chair was turned around and I planted face first into the side of the hut. Thankfully I didn't tip the heater over; otherwise, the hot surface can easily melt the monofilament line. Still trying to get out of my chair, I sorted out which rod was being bit. I could see the spring bobber slowly dipping. Finally, I got to the rod, detached all the accessories, and waited for the slack to tighten up again. I could feel a definite weight on the rod so I set the hook hard and it was on! This time, I let the fish run and tried desperately to reel up my second line while the fish was running. Still, I only had the line halfway up before I needed to reel up the slack on my fish. Even with my best effort, the fish found my other line and it was now tangled. I was fearing the worst, but At the hole, I could see that the second line merely went around my line once. Just as the fish was coming up the hole, I felt as though the fish had popped off the hook. I desperately drove my left arm into the hole to pin the fish against the side, while my right hand dropped the rod and went for the bear scoop. I had no idea where the hooks were at the time...all I wanted was to land the fish! With the fish pinned, I bear scooped the fish out in one go. Finally, mission accomplished! Zero dark burbot - it was truly a zero dark thirty fish since I had no idea what time of morning it was AND I was rudely awaken when I was comfortably in a deep sleep. The fish was actually deep hooked. The front hook had popped out but the stinger hook was secured around one of the gill arches. It wasn't bleeding so I could have released it, but I seriously wanted to try some burbot fillet. People call them poor man's lobster and I wanted to substantiate that claim. I woke Michael up to tell him about my catch (and also to help me take a picture :P). We were both surprise that this fish bit at 6:15am. 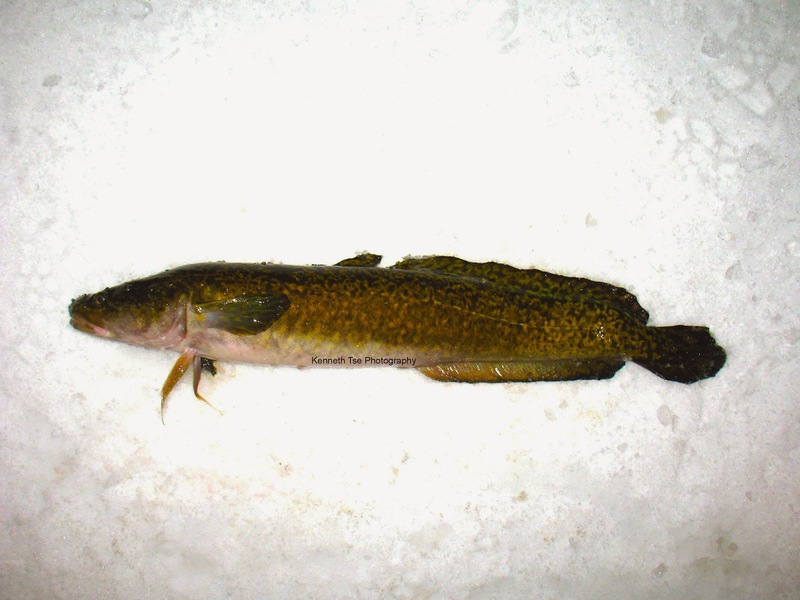 Everything we've read about Burbot indicated that they were nocturnal feeder and they usually stop biting around midnight. Surprisingly, when I went to check the history on my sonar, it didn't mark this fish on the screen. The Burbot must have been very tight to the bottom. We fished with more focus until sun up but that was all the action we had. Matt and his family was slowly getting out of bed so Michael and I packed up to join them on the northern end of the lake for some morning whitefish. We set up in about 80 feet of water at about 8am. Here and there, I would make a bigger fish on bottom, but most of the fish appeared to be Rainbow Smelt. Matt had a few fish chased his lure several feet off bottom and finally connected with a Lake Whitefish. The rest of us had very little action aside from a few overzealous Rainbow Smelt. Michael had never caught a Rainbow Smelt so he was able to add a new species finally. By noon, we were tired and tired of the slow action. Matt, Jeff and Papa decided to fish another lake on the way home. Michael and I were going to check out one other spot on the lake, but we were both tired and grumpy so we decided to call it a day. 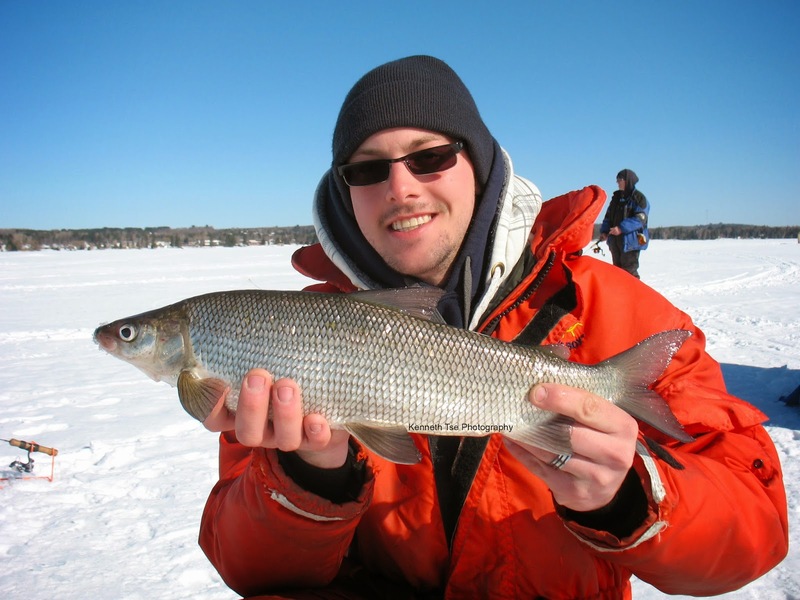 It wasn't the steady action that we hoped to find on both the Lake Whitefish and Burbot front. But it was a fun weekend with friends and it offered me an opportunity to determine if my gear was adequate for a more substantial overnight excursion in the future. I think I'll need a more powerful heater if I were to last a couple of nights on the ice again. Before I end this report, I wanted to give you the readers a couple of fish cleaning tips. Cleaning fish at home can be messy, especially when you have little counter space or very picky family members. In my case, I had both. I figured out a fairly neat way to keep your kitchen counters clean and give you a substantial surface to clean your fish. I introduce you to the PIZZA BOX! I find extra large pizza boxes to be prime fish cleaning surfaces. The cardboard readily soak up blood and slime and give you a fair grip on the surface even when the cardboard is wet. When you are done, simply throw out the pizza box and you have a counter top that is as clean as it was before. It was much better than newspaper and you do not risk ingesting ink. I hope this is helpful for some of you. 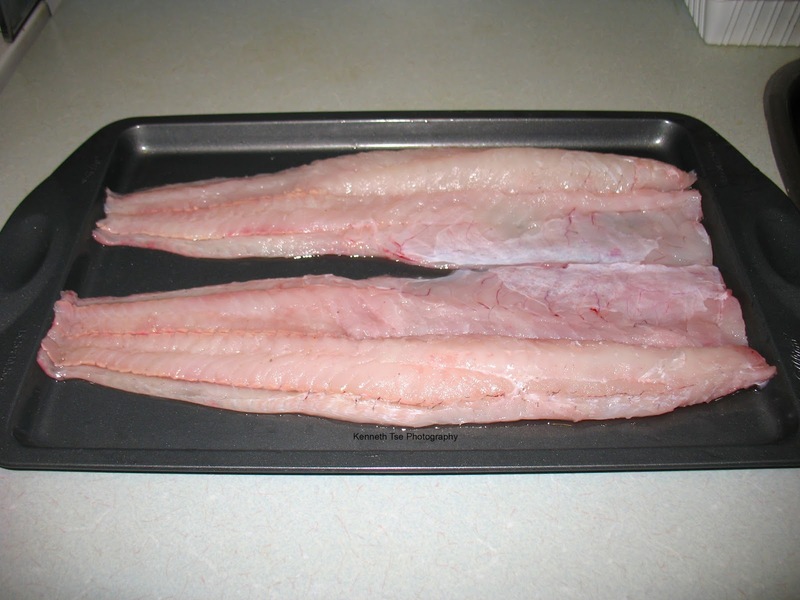 I watched a number of instructional videos on the proper way to clean a burbot. All of them suggested that there was little meat in the belly of the Burbot. Some of them suggested that the rib bones that pointed outward, in similar fashion to catfish bone structure, meant it was difficult to save the belly meat (or not worth the effort). 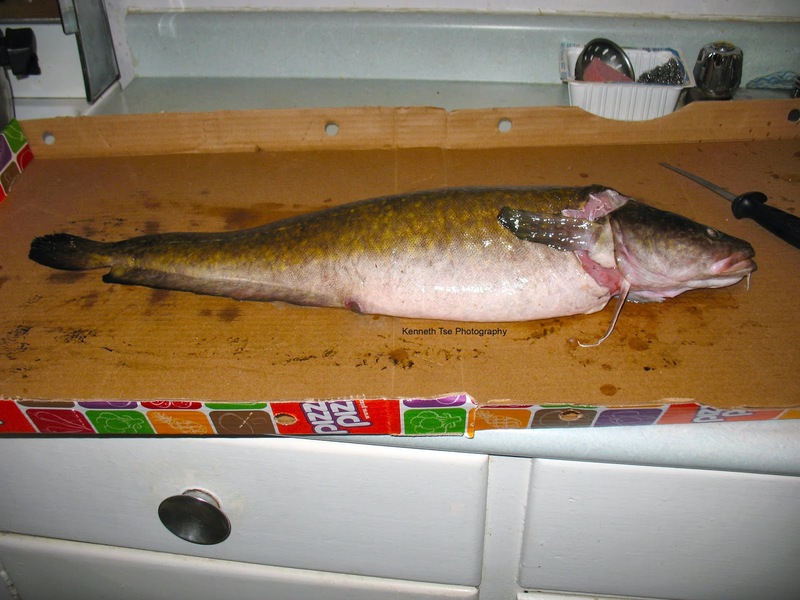 When I cleaned the Burbot last night, I stumble upon this method on my own. Using a pair of kitchen shears, I cut across the pin bone that was attached to the side of the vertebrae. Burbot has a fairly unique bone structure. The pin bone were stout and long while the rib bones were thin and short. Perhaps this is why people often mistaken the pin bones for the rib cage. The pin bones were strongly attached to the rib bones such that it was difficult to cut through them with a knife, unlike many other fish such as salmon with thin pin bones. Using my kitchen shears again, I cut the joint between the pin bone and the rib bone to free the connection. Once the two sets of bones had been detached, it was a simple matter of removing the pin bones in tradition manner (making two cuts on either side of the pin bones and pulling the strip of bones off the skin), and removing the thin rib bones in traditional manner (making a shallow cut just below the rib bones to remove them). In the end, I was able to save all the belly meat. In fact, the belly had rather thick slab of meat that weight even more than the meat on the tail. What a shame it was that people don't spend the time to save that amount of meat! Here are my burbot fillet with pin bones and rib bones removed. I really want to go back to try for more night time burbot. But with the ice season winding down and my budget being prohibitively restrictive, I doubt I can go back again this winter. :( Hopefully we'll be better prepared next season for a full out assault! ...who is the fairest of them all? This, my friends, is my first carp of 2014...and it is my first mirror carp! Our research associate asked for our absence at the lab on Friday since we were having a lab inspection. I was home looking outside at a beautiful day. I had been working for 2 weeks straight putting in almost 10-12 hours each day. You know that grumpiness starts to emerge when you are stressed and been away from the water too long. Dave mentioned that he had seen Gizzard Shad along the lake recently. I wanted to try again for these very annoying fish. They are annoying because their diet consist of everything that we cannot possibly imitate - zooplankton, detritus, and algae. In the winter, due to the lack of food, they are a little less picky and they may occasionally take nymphs and even a small worm. But the key is to find a concentration of shad. When I arrived, Dave said he had already caught a 30lb carp and lost a mirror carp right on the surface. Dave knows his carp here, so when he's having success, I'm not about to forgo that opportunity to get on a hot bite! I set up my carp rod and let it soak while figuring out how and what to present to these shad. Before I even attached a float on my shad rod, the baitrunner was already sounding...I hadn't even chummed the swim! Using 8lb mono only, I had to play the carp carefully over this zebra mussel encrusted bottom. 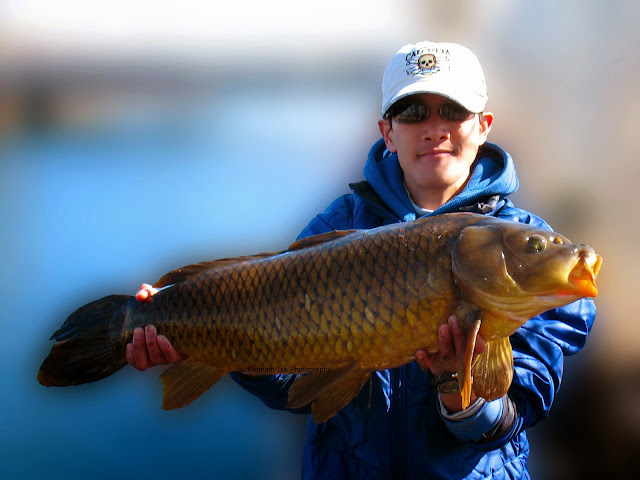 The best thing to do was to pull the carp toward the surface and to prevent the fish running the line on the bottom. While Dave was getting the net, his rod went off. DOUBLE! Dave's fish was obviously larger than mine, and I heard him said it might be a 30 (pound fish). So now we have an issue. We were fishing on a steep wall that was 5 feet above the water. Dave had a net with 4 feet handle so he must lie on the ground to reach the fish. We were fishing on a very narrow strip of land where we had a fence behind us, and a rusted railing in front of us. The ground we were standing on was one half iced and one half muddy. On top of the ice and mud was enough goose dropping to make all of it slippery and foul. Dave had to get down to lie on this mess while trying to land those carp. We have one decent fish and one husky one that wanted to run into each other. If the lines were to tangle, that would be a complete disaster. The situation was made further desperate when we discovered my fish as a mirror carp and I had never caught one before. Dave wanted to land the mirror carp more than I did! I made a suggestion...let's get these carp under control, and when they seemed calm enough, I'll hold both rods while Dave get down to net one fish, get it up the wall, then net the other. My smaller mirror was more cooperative but it was on 8lb mono. Dave's bigger carp was on 20lb mono but it was headed toward a floating tire buoy anchored by a chain. Somehow, I managed to turned my mirror carp into the waiting net on the first try. We got it up the wall, unhooked it and put it on the carp mat and with one foot preventing the carp from wriggling back into the water, I turned Dave's carp several times before we got it in the net. As I was unhooking the mirror carp, I noticed a second leader and hook on this carp. It was Dave's rig! 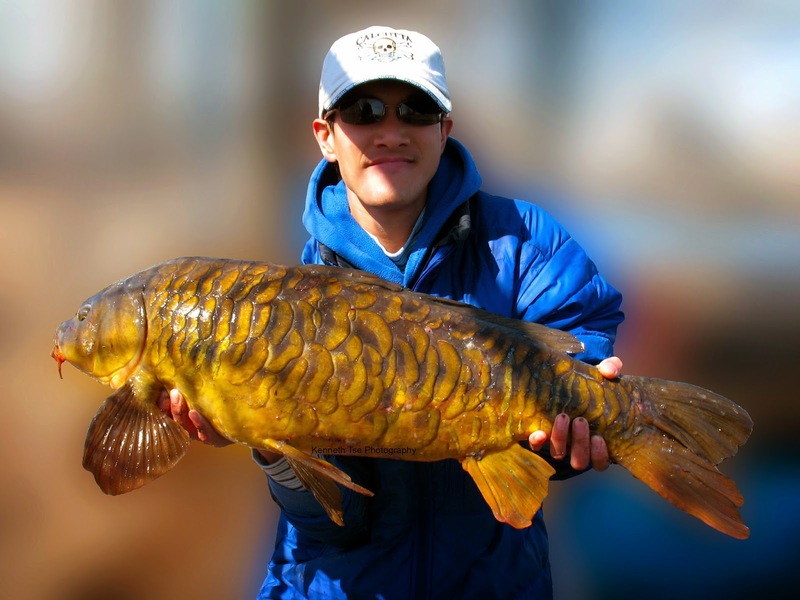 We were both surprised since a hooked carp rarely come to back to the same swim. It was even more remote that the carp would bite again on the same day...never mind the same hour! The picture of my mirror carp is above. But I really want to show you Dave's piggy! We weighted the fish in the net and the carp was 40lbs! This was the first time I've seen a true 40! After this excitement, I wanted to get back on my Gizzard Shad hunt. Although the shad were present, we didn't find anything resembling a concentration. There were the odd loose school or a pair lazily swimming around. 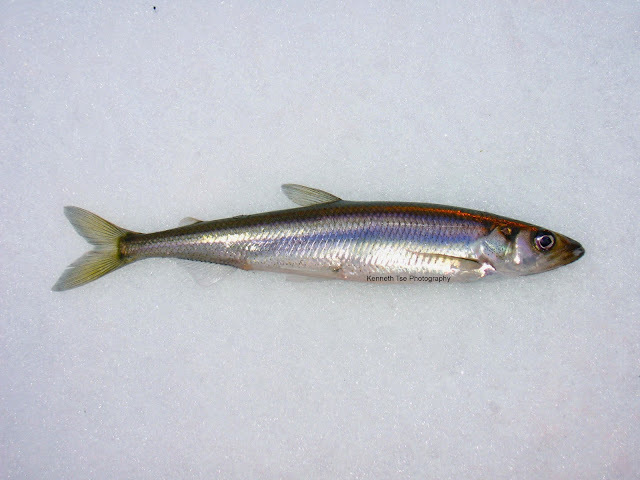 Once in a long while, a shad would surface but there is no consistence to where they would surface and what they were, if at all, taking off the surface. I thought perhaps they were taking emerger since there were a few caddis around...but after drifting nymphs through the water column at different depths, including subsurface, it seemed like a really steep uphill battle with so little shad around. 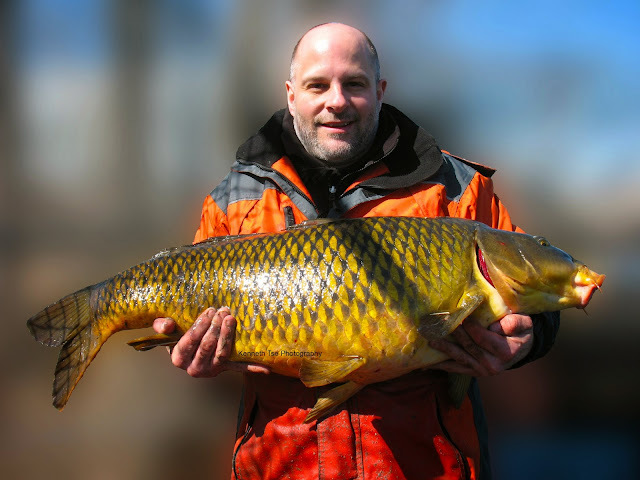 Instead, Dave and I put more focus on the carp. In total, we landed 9 carp - Dave landed 6 (40lb, 30lb, 25lb, 21lb, 10lb, and 7lb) and I landed 3 (mirror, 12lb, 15lb). We got off the water just before sunset. For a 4 hour session, that was a hell lot of fun! I guess I could have caught more carp if I were to put more effort into chumming my swim, but I was always looking out for those shad and having the shad rod ready when I see them. Dave was hoping that I would break my PB today, but I didn't catch one over 25lb. I'll go back to put more time at this spot in the future and hope to get a 30...or perhaps a 40...in the future. I've had a tough icefishing season. I wasn't able to fish as much as I liked...and it seems, aside from a couple of exceptions, I always fished on the slow days. It was simply enjoyable to cast some rods into open water again and get them bent!